Hey y'all! It's almost April. I hate to hurry life but I'm about five weeks away from summer and that makes me happy. 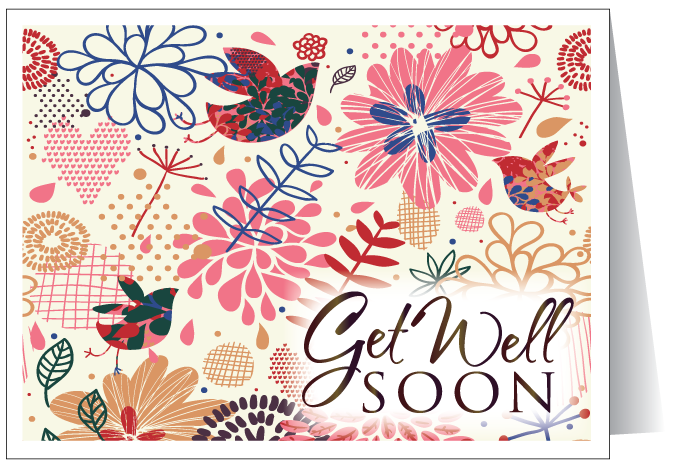 I'd like to first say "Get Well Soon" to my Oma! She has been in the hospital for a week due to complications with her gallbladder. The gallbladder is gone but the after effects are still giving her trouble and she is still really sick. She's having another procedure today but may have to have another serious surgery. She's a tough woman but her body is fighting against her right now so positive vibes would be appreciated! Because of our already crazy schedules and trips to the hospital, I haven't had time to cook too much so today isn't showing anything fancy. 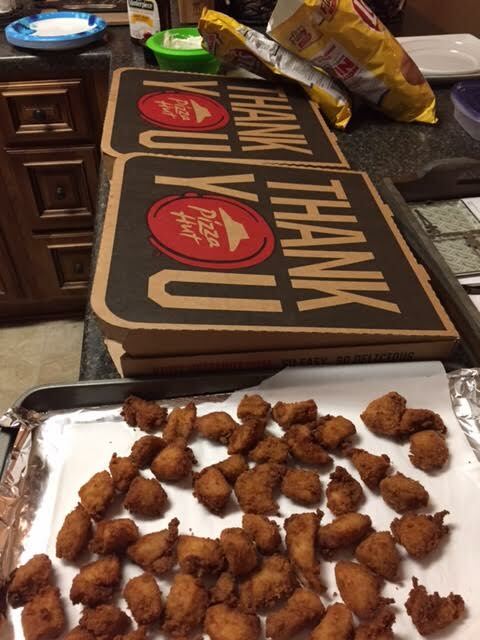 Thanks to Ian for always helping me with dinner (by helping I mean he usually does all of it). I am planning on weighing this weekend. I haven't been doing as well as I should (though I've been on track since Monday) so I really, REALLY don't want to. Oh well, it's just a number on a scale. We shall see what it says and move on from there. 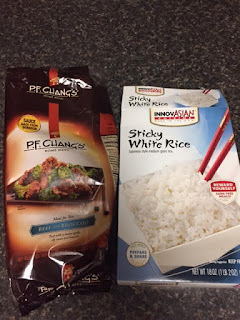 I want to show you a quick meal from the freezer section. I know it's not glamorous but when you are short on time, it's not a bad solution. 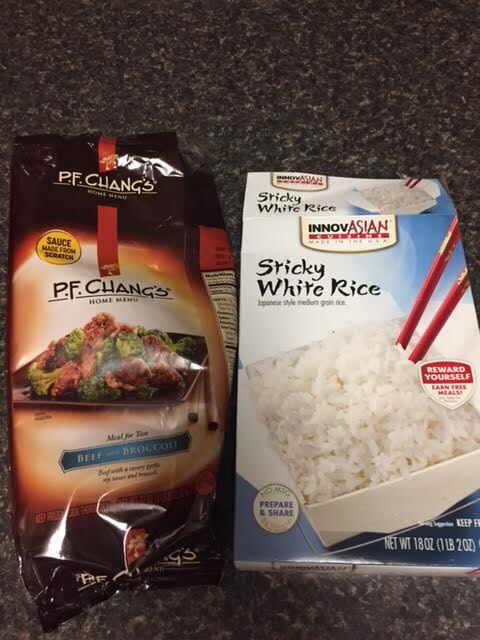 I hate cooking rice so I prefer to use the sticky rice in the freezer section. It's fast, tastes great and I can't screw it up. The other discovery I made was PF Chang's frozen Beef and Broccoli. It was so good! Ian whipped it up in no time. 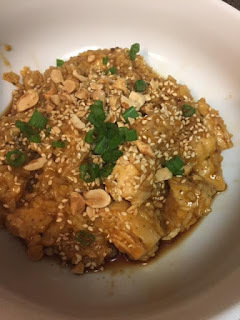 He prepared the sesame chicken for himself and enjoyed it. I recommend it for those nights where you need something filling and fast. Sure, it's got a lot of sodium and is nowhere near "clean" but ain't nobody got time for that this week. The other week I picked up thin-sliced ribeye steak. I love steak and for me, there's nothing better than a giant ribeye for dinner. Because those set me back 700-800 calories, I thought the thin ones may be better. So, Ian grilled them and I served them with fried eggs on the side (I used non-stick spray with no butter). I plopped a bit of Ian's mashed potatoes on the plate too. I really liked the steak. It reminded me of my childhood a bit. I was able to get the rich taste of ribeye for half the calories and money. Finally, I was in charge of Sunday dinner this week while my mom was at the hospital with my Oma. My mom also had the flu last week so it hasn't been the greatest couple weeks for the Wyatt family. Anyway, I made a "Skinny Chicken Parmesan" Casserole. The only thing skinny about it was the fact that there's no butter, I used lower fat mozzarella and wheat pasta. It was still 510 calories for 1/8th of the casserole. 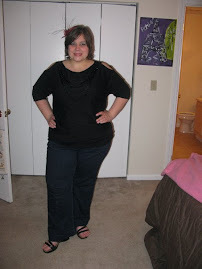 It could have been worse but I don't know that "skinny" is the right word. I will say though, that it was super easy to make. 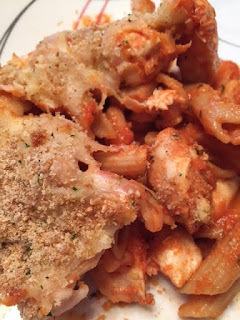 You put the chicken and pasta in the dish uncooked with water and spaghetti sauce and bake it at 425 for 30 minutes. Stir it all around, add cheese and breadcrumbs and pop it in for about 10-15 more minutes and it's done. It was good. It wasn't life changing. 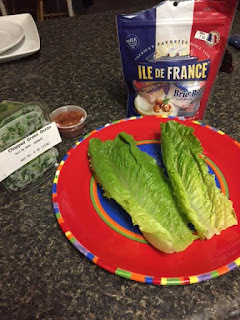 So, the point is, I'm hoping to be back next week with an actual recipe but until then, I wanted to show you what I'd been eating on the move this week. It seems almost certain that I've used the title "Spring Cleaning" before but I don't care. It fits. Over spring break, I played in the snow in Boston with Ian and had an amazing time. I did a full recap on this in my "Chasing the Sun" piece on readtheleaf.com (not to plug myself too much). It was cold but it was a blast. 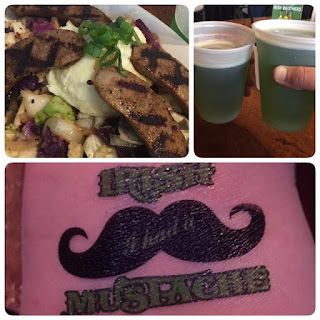 When I came back, it was St. Patrick's Day and I had fun celebrating that. 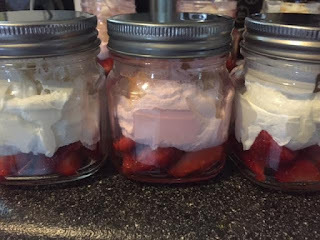 On Saturday, I went to a baby shower and made adorable strawberry parfaits in mini mason jars. After that, I tried to squeeze in as much rest and school work as I could. This week, I'm back on track. 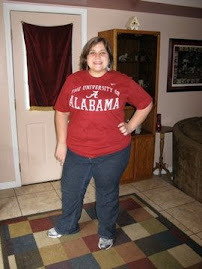 I weighed on March 10th before I left and weighed the exact same amount I did on February 22nd. I am sure that I gained over the break so I'm waiting to weigh again until 3/31 in hopes to do a little "spring cleaning" with my body. 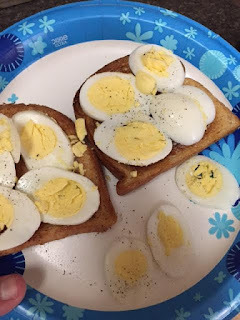 You can tell that I'm back on track when I have hard boiled eggs on toast for breakfast. It's not that I don't like it and it actually fills me up but on vacation I took advantage of the free omelets and unlimited bacon every day. I've done well this week getting back into a routine. I love 9 Round but it's not open on Sundays and sometimes I just don't have the energy to drive across town if I don't have to. I try to go there 4-5 times a week but there are occaisions where I exercise at home. Sometimes I like to kickbox at home on the bag Ian got me and I will walk but I don't have a lot of stamina when someone isn't pushing me or the exercise isn't regimented. 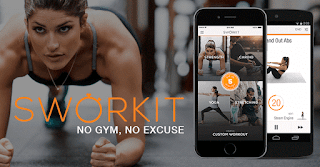 I discovered an app called SworkIt while watching Shark Tank. It's awesome and I highly recommend it. It's kind of like Pandora. You choose your style of workout: cardio, stretching, strength or yoga and then you choose how long you want to work out: 5, 10, 15, 20, 25 minutes and up to an hour. I often choose cardio and what I like about it is that you do 30 second increments of each exercise and if you don't like it, you can just skip it. 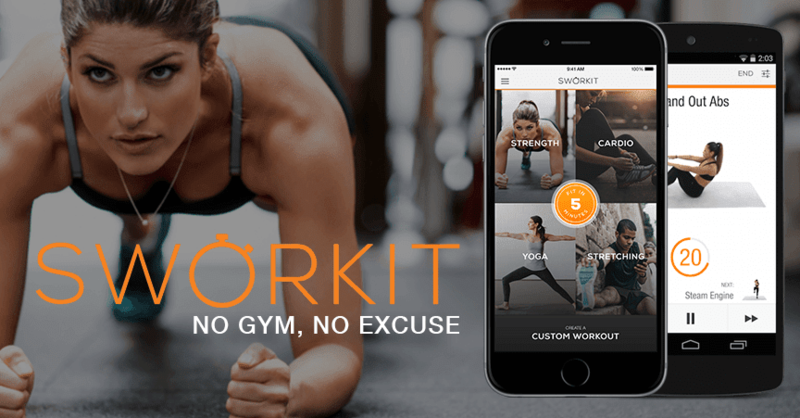 It's great for when the gym is closed or when you don't feel like leaving home. Best part is that it's free. Since I've been back, I've also managed to whip together one recipe. 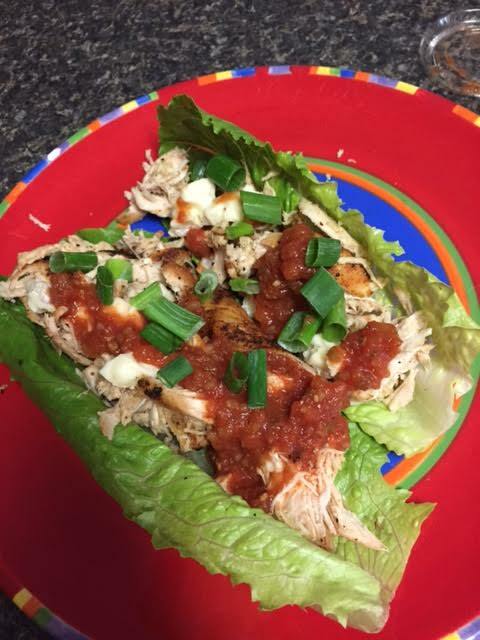 I made Spanish Chicken Lettuce Cups. Or, at least that's what I'm calling it. 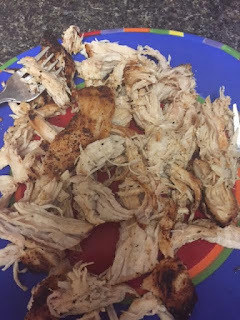 All I did was add cumin, chili powder, garlic powder, smoked paprika, salt and pepper to a chicken breast and had Ian grill it up for me. When it was done, I shredded it, added it to two big pieces of romaine and then topped it with leftover Moe's salsa, green onion and these ADORABLE and DELICIOUS baby Brie bites I found at Fresh Market that are only 70 calories and soooo goood. This was great because it had a lot of spicy flavor. It's amazing how far one chicken breast can go when you shred it. I'll holla at y'all next week! Hey y'all! I am soooo close to Spring Break that I can taste it. Ian and I are going to Boston on Monday and I can't wait! It's making it difficult to complete the week but I'm getting there. I'll probably weigh on Friday or Saturday just to see where I'm at then wait a couple weeks AFTER vacation so I can drop a few pounds of "travel weight." 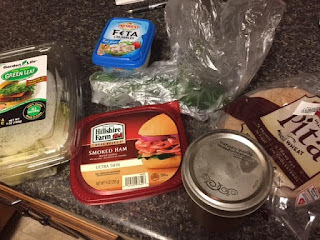 Since we are going out of town, I wanted to make something that would last a few days and use up some groceries we have rather than buying too much that could go to waste while we are gone. I found a chicken enchilada soup on Pinterest so it's not my recipe. Ian actually made it! It was a crockpot recipe and super delicious. You cook up a pound of chicken breasts in a skillet (they need to be cut into bite size pieces or you can shred them) and then toss the cooked chicken into the crockpot along with 4 cups of chicken broth, three small cans of green enchilada sauce and two tiny cans of green chills, 1-1/2 tablespoons cumin, tablespoon chili powder, teaspoon garlic powder and salt and pepper to taste. Let it go for 3-1/2 hours. At that point, add in instant rice and a block of cream cheese (cubed) and let it go another 30 minutes. We used low fat cream cheese so it didn't melt in as well as full fat would but honestly, I kind of liked having little bites of cream cheese. I think an immersion blender would have helped. 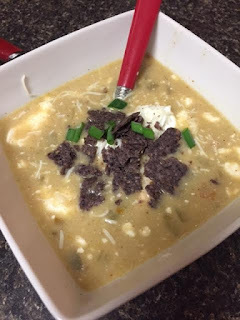 We added low fat sour cream, a few crushed blue corn tortilla chips and skim mozzarella cheese. It was so filling and had awesome flavor! I think it was using the green chili sauce. I've eaten it three times and Ian has eaten twice and we still have a lot left. Also, I wanted to share my quick pita lunch! This isn't anything revolutionary but it was delicious and huge! I went to the Cheesecake Factory a few weeks ago and noticed that sold their "Skinnylicious" dressings. I ended up buying their sesame ginger dressing and it's really tasty. It's a bit on the sweet side but I mixed with salty feta and ham. It's only 15 calories per tablespoon! 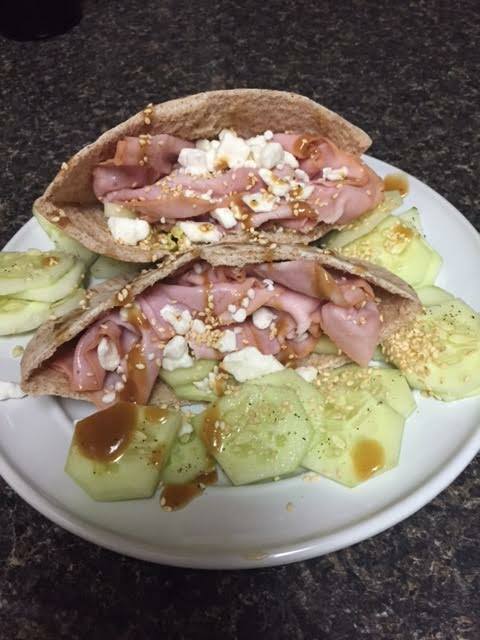 All I did was add that, lettuce, cucumber, ham, fat free feta and toasted sesame seeds. I thought it was pretty and it tasted great. 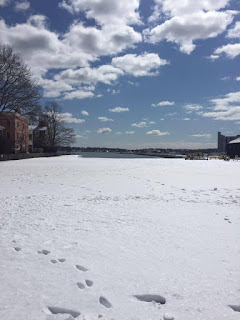 Because I'll be in Boston, there will be no blog next week. I will pick it back up on the 22nd. So, have a great couple weeks and St. Patrick's Day! I also wanted to take a moment to wish my Aunt Brenda a HAPPY BIRTHDAY! She lives in Chattanooga and had a birthday Monday. Hope you had a great day! Finally, HAPPY ANNIVERSARY TO IAN! 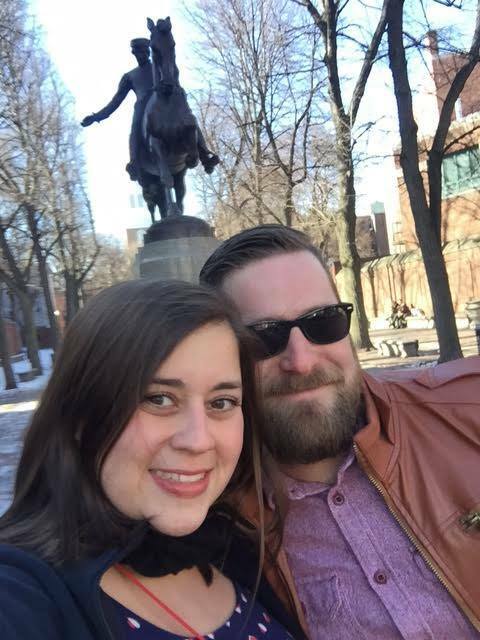 We celebrated 3 years "Facebook Official" yesterday and we are going to dinner tonight. You make me happy sir and well, that's not always easy to do. Hey y'all! It's officially March. I'm just as surprised as you. Happy Ash Wednesday to those out there celebrating. As I mentioned last week, I'm holding off on weighing until right before my vacation in order to decrease negativity and give myself a chance to shake off the few pounds I gained. The picture above is from the spread I had on Oscar night with Ian and Jordan. Despite my gluttony that night, I've done pretty well. 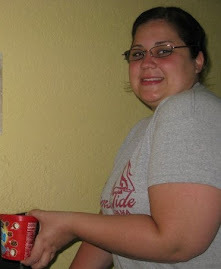 I've been super busy which always helps my calorie intake. I went to a conference last week for writing which I've been saying was both motivating and soul crushing. The agent I met with said that I had a "tough sell," for a book called MLWOR because I am not famous. I am acutely aware of my lack of fame but feel my book deserves a chance. I figured out a lot of things I can do to work on the book and my "pitch." I have to make myself marketable so there will be some visible changes in terms of format but there will also be a number things I am doing behind the scenes to try and make this dream a reality. In the past few weeks, I posted more recipes than usual and it won't always be like that. There will be some inconsistencies so I appreciate those who have stuck with me and any new readers that I have. I'm a writer, not a marketer and in today's world, it looks like you have to be both...especially if you want to write non-fiction books about food and life. Now, having said that, I only have one "recipe" for you. Ian and I discovered these Campbell's pouches and thought we would give them a try. 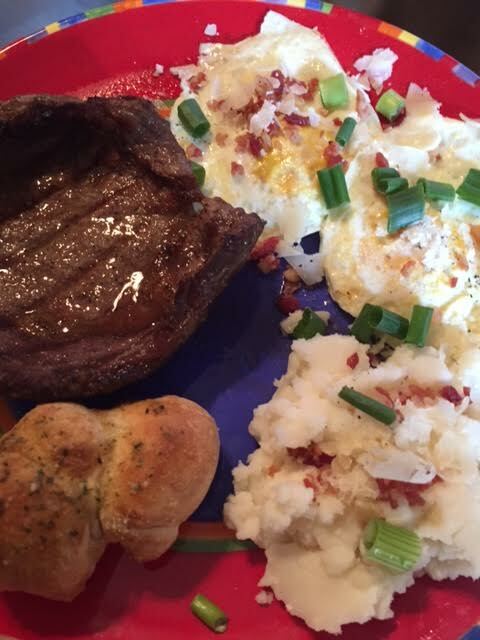 Ian cooks dinner most week nights and for him, the simpler the better. That's not to say he isn't becoming a great cook but he is someone who admires quick and easy recipes and you know what, I'll take it. It means dinner is ready when I get home. He leaves the creativity and more complex food to me. So, as a warning, there's nothing "clean" about this recipe. 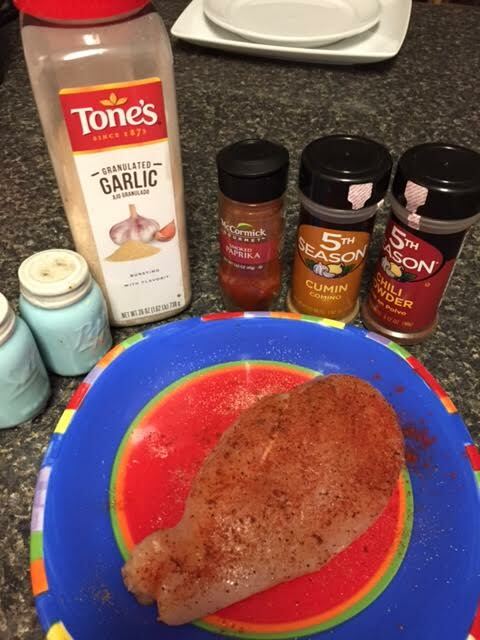 All you do, is take chunks of chicken and cook them in a skillet until there's no pink left. 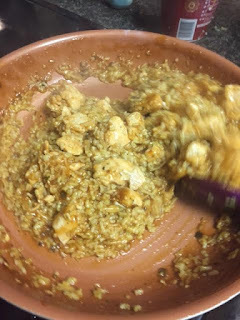 Add the sesame chicken sauce (there are other flavors too that we haven't tried yet) to the chicken and toss around. 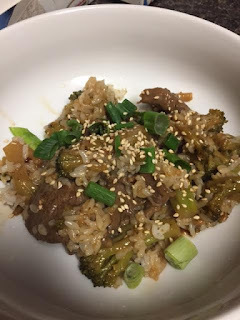 We used instant rice because I have a strained relationship with cooking this sticky grain. And, of course, it was a time saver. We tossed the rice and sesame chicken together. 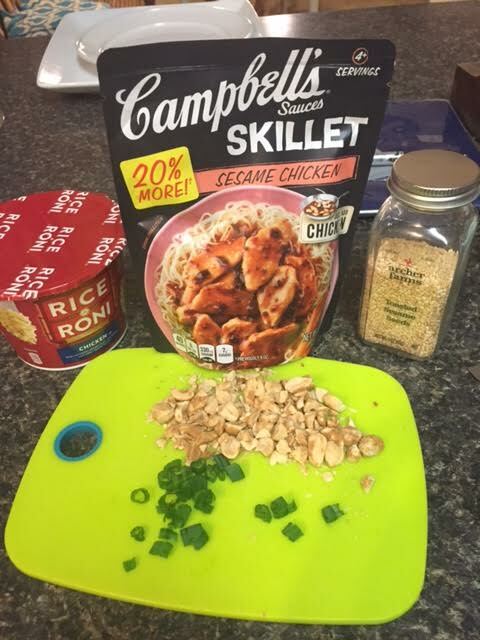 Then, because I can't help myself, I topped it with some chopped peanuts, sliced green onions, toasted sesame seeds and a bit of soy sauce (the sauce itself is already pretty salty). This was great for a family who is already on the run or perfect for a single person who worked all day and wants a hearty meal within 15 minutes. It tasted great, actually! Jazzing it up with toppings made it even better. This is definitely something we would make again. 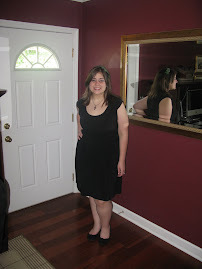 This picture was a LONG time ago...I've put on a considerable amount. I'm somewhere in the middle of the lowest and the highest. 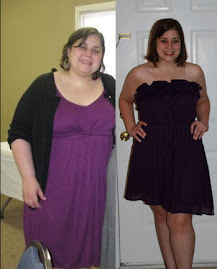 I finally made it to 85 Pounds! 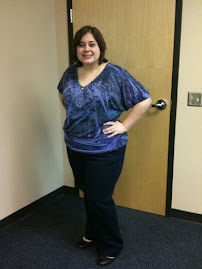 I'll post another picture at 100 Pounds...hopefully in the next 4 or 5 months! I am what my Dad calls a healthy girl who is trying to be less...healthy? None of it makes sense but I am going to attempt to hash it all out here. I love my dog, my family and my friends. Seems silly to tell you much about myself since I will be telling you that sort of thing quite often.